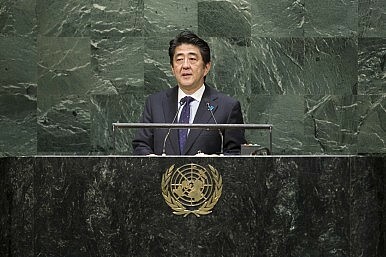 Shinzo Abe speaks at the 2014 UN General Assembly. On the eve of his speech at the United Nations (UN) General Assembly, Japanese Prime Minister Shinzo Abe contributed an op-ed piece to CNN. In the piece entitled, “Lessons learned for a better world,” Abe explained that Japan has extended assistance to the developing world with three elements in mind: human security, support for self-help, and sustainable growth. Assistance on maternity care, provision of training and internship opportunities, and assistance in strengthening disaster preparedness and post-disaster reconstruction are identified as the example of Japan’s past contributions in this area. Indeed, Japan has been one of the major players in economic assistance to developing countries since it first began to provide official development assistance (ODA) in 1955. Despite criticisms, Japan’s ODA has contributed to improving various aspects of life for those in the developing world by focusing on non-military assistance and prioritizing in investing in infrastructure, education and training, and public health, all of which are critical in people’s day-to-day life. Japan’s new ODA Charter, adopted in February 2015, maintains “human security,” “support for self-help,” and “sustainable growth” as the key principles that underlie Japan’s ODA practices. While allowing greater flexibility for the types of assistance that can be provided in the name of capacity-building in various areas, the new ODA Charter maintains a primary emphasis on the non-military nature of the assistance. For the last two decades, however, Japan’s ODA has experienced a major setback — Japan’s own economic malaise simply does not allow Japan to keep its ODA as large as it once was. After reaching a peak in 1997, Japan’s ODA has been in a steady decline. Today, Japan no longer enjoys the status of world’s second largest ODA donor, behind only the United States. Rather, as Japan grapples with shrinking ODA, it continues to search for the most appropriate ways to prioritize limited funds in order to optimize the impact. Simply put, the period when Japan was able to boast about its influential place in the development assistance community has been long over. It was regrettable, therefore, that Abe did not elaborate on how Japan’s “proactive contribution” should involve more than ODA. Abe does say that the recently passed security legislation will allow the Japan Self-Defense Forces (JSDF) to play a greater role in international activities, but he falls short of articulating that a “proactive contribution to peace” is most effective when it is executed with an all-of-government approach. Within Japan, when talking about a “tangible” contribution to the international community, the attention is often narrowly focused on how many UN-mandated and other multinational efforts the JSDF participates in. But when Japan describes its “contributions” to the rest of the world, it tends to point to its history of (and accomplishments in) economic development assistance. But, in today’s world, “each country’s security is threatened in a world where instability and poverty still exists somewhere else,” as Abe acknowledges in his piece. Military measures alone cannot sustain peace without prospects for economic prosperity. But economic development cannot take place unless people’s basic security and safety are protected. In other words, it takes both military measures and economic assistance to achieve and sustain peace. Maybe Abe can share his perspective on how Japan uses both military/security and economic tools to implement a “proactive contribution to peace” initiative when he speaks at the UN tomorrow. What Did Japan Accomplish at the UN General Assembly? Putin, Park, and peacekeeping: recapping Shinzo Abe's busy week in New York.